D23 RUMORS: Confirmed or Busted! It’s the biggest news week for Disney and it only happens every other year! The D23 Fan Expo is happening July 14-16, 2017 in Anaheim, California – right down the street from Disneyland Resort! What rumors will be announced as confirmed this weekend? There are more WDW rumors flying around than you can shake a Premium Mickey Bar at, so we’ve rounded them up and we’ll keep you posted on what’s confirmed, what’s busted, and what’s announced that flew under the rumor radar! Keep checking back daily to see the status of your favorite rumors – and follow along with us on Instagram, Facebook, and Twitter as we report LIVE from D23! RUMOR: Tomorrowland Speedway is closing to make room for TRON Lightcycle power Run. Tron attraction is coming to Magic Kingdom! This is exciting news! If you aren’t familiar with the attraction at Shanghai Disneyland, take a moment and check out YouTube. This attraction is really going to be an “E-Ticket.” The roller coaster attraction will occupy an undeveloped area next to Space Mountain. This amazing attraction is expected to open in time for the 50th Anniversary of Magic Kingdom. RUMOR: Expedition Everest will close for a lengthy refurb to fix the Yeti. RUMOR: Rivers of Light will be cancelled. RUMOR: Disney’s Coronado Springs and Caribbean Beach Resorts will become “Deluxe Light” after their renovations. RUMOR: Disney’s Art of Animation and Pop Century will become “Value Plus” after the overhaul at Pop. RUMOR: Disney’s All-Star Music, Movies, and Sports resorts will be refurbished from 2018-2020. RUMOR: Star Wars Land will get a 2019 opening date. No specific date has been set for the hotly anticipated new land, but the good folks at Disney are still saying it will open in 2019 (the previously slated date) so no push back to 2020 is still good news! We DO know the official name of the land: Star Wars: Galaxy’s Edge. RUMOR: Toy Story Land will get a 2018 opening date. Bob Chapek announced that Toy Story Land will be opening at Disney’s Hollywood Studios next summer! 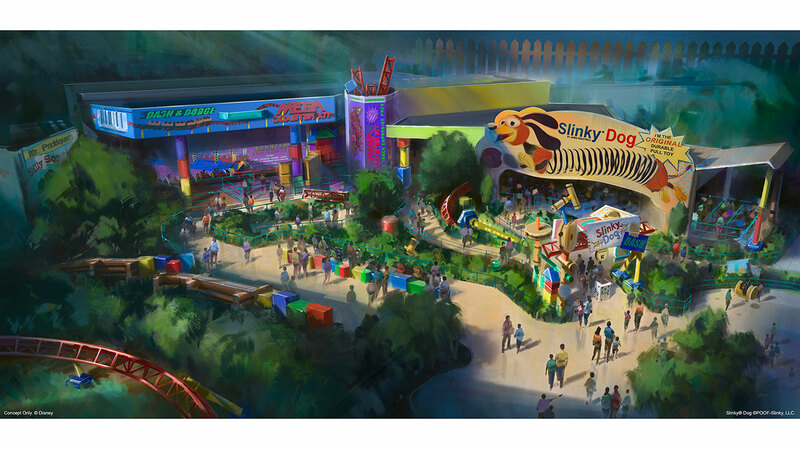 You will be able to enjoy a family roller coaster called Slinky Dog Dash and Alien Swirling Saucers. RUMOR: Disney’s Hollywood Studios will get a new name. RUMOR: A Guardians of the Galaxy coaster will replace Ellen’s Energy Adventure. In addition to a new restaurant, Epcot is going to receive several new attractions. First, a Guardians of the Galaxy themed attraction is coming to Future World. This will be replacing Ellen’s Energy Adventure, which will close on August 13th. RUMOR: Epcot’s getting a new entrance plaza and an Innoventions overhaul. RUMOR: The Seas will become The Marine Life Institute. RUMOR: Spaceship Earth is due for some big changes. RUMOR: Mission Space will be updated. Epcot is scheduled for an overhaul over the next few years, and that includes a new restaurant! Located near Mission: SPACE, the restaurant will feature incredible views of, you guessed it, space! The cuisine and opening date have not been shared but it’s sure to be out of this world! RUMOR: World Showcase Pavilions will become more focused on characters – like Coco, Mulan, Ratatouille, and more – including new attractions! World Showcase will also be getting a new Ratatouille based attraction in the France Pavilion. In this adventure, guests will “shrink” to the size of a rat as they are chased throughout a restaurant. The time frame has this attraction opening by the 50th anniversary of the Walt Disney World Resort. In addition, the China Pavilion will be given a new film. More World Showcase attractions are in the works but not confirmed at this time. RUMOR: IllumiNations will end its run. RUMOR: Magic Kingdom will get a new nighttime parade – but not until 2021. 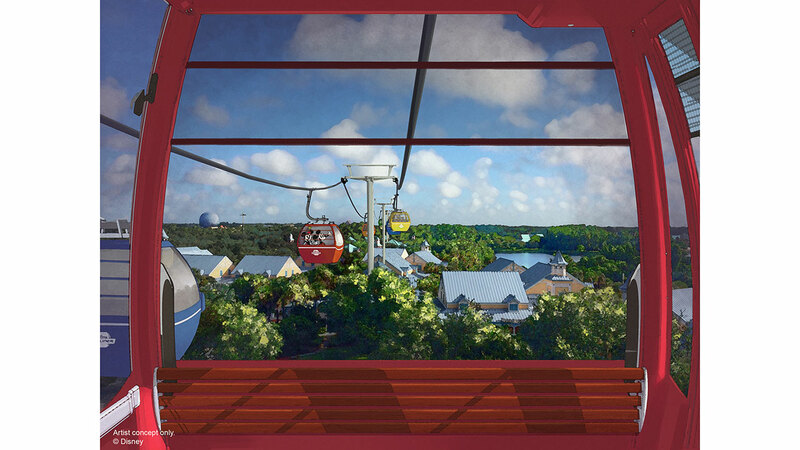 RUMOR: A Gondola System is coming to select parks and resorts. 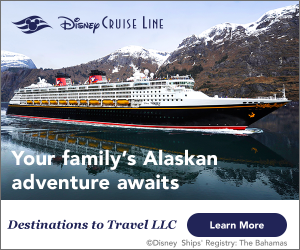 Walt Disney World is expanding guest transportation options! First, the Disney Skyliner is a gondola system reminiscent of the old Skyway found at Magic Kingdom. The Disney Skyliner will connect Disney’s Hollywood Studios and Epcot International Gateway with Disney’s Art of Animation, Disney’s Pop Century, and Disney’s Caribbean Beach. Rumors were already circulating after permits were filed in these locations. No opening date has been announced. RUMOR: “Minnie Vans” to become Disney’s own Uber-like service. 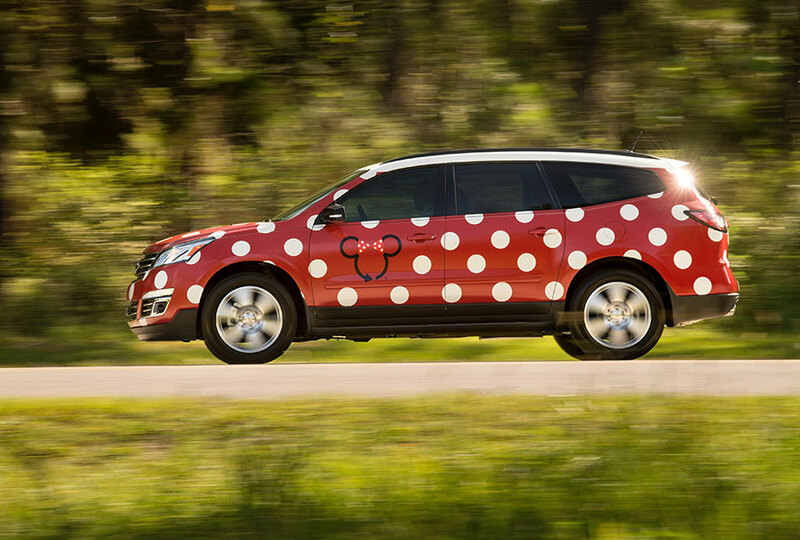 BUT, WDW will be debuting an on-demand ride service this summer/fall and the vehicles will be called Minnie Vans. However, they’ll be using Chevrolet Traverse vehicles and there’s no word on the actual design of the vans. The fist resort for the program to be rolled out in will be the BoardWalk Inn. RUMOR: Zootoopia is the next land headed to Animal Kingdom. If you are a big fan of The Great Movie Ride at Disney’s Hollywood Studios, we hope you have your trip planned before August 13th. At that time, the attraction will be closing for good to make way for a new adventure: Mickey and Minnie’s Runaway Railway. 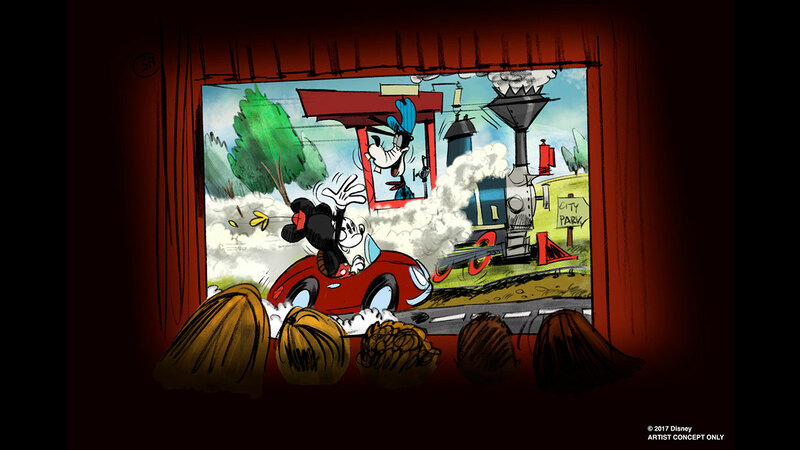 Guests will be placed into the world of a Mickey Mouse Cartoon Short with amazing special effects and a fun theme song. If you simply cannot get enough of Star Wars, listen up! 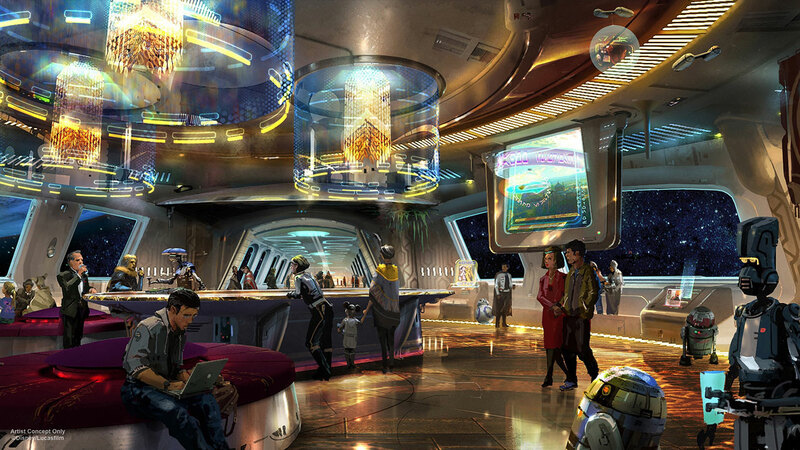 Soon, you will be able to become a part of Star Wars through a completely immersive hotel experience! Disney Imagineers are busy creating a luxury resort for Walt Disney World that will make you an active citizen of the galaxy. In fact, every window within the resort will feature a view of space! No specific details, including opening date and cost, have been released. However, having it ready for the opening of the new land at Disney’s Hollywood Studios would probably be a wise move. Speaking of the new land, it finally has a name: Star Wars: Galaxy’s Edge! RUMOR: New entertainment options are coming to Magic Kingdom by it’s 50th anniversary in 2021. 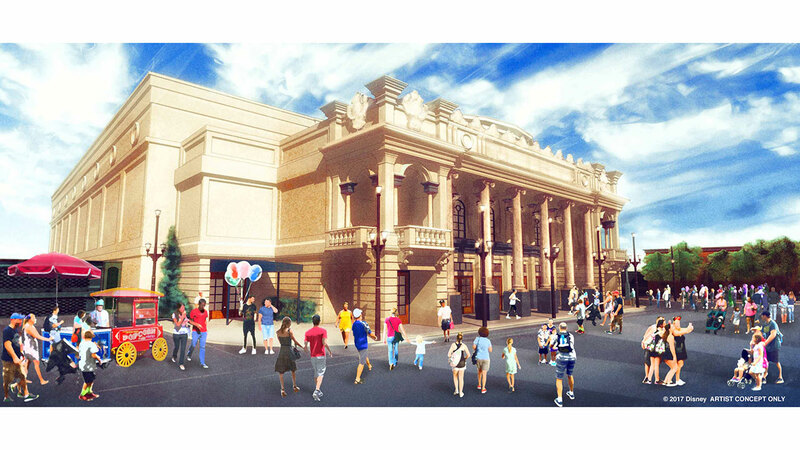 A new theater is in the works for Main Street U.S.A. at Magic Kingdom. The new venue will be modeled after Willis Wood theater, which was found in Kansas City in the 1920’s. The entertainment that will be housed in the new theater has not yet been announced. Expect the new location to open in time for the 50th Anniversary of Magic Kingdom in 2021.